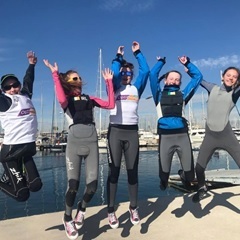 On March 6, 2019 a group of keen NYC Optimist sailors who have been training throughout the winter, travelled to Valencia, Spain for the 2nd Optimist Orange international regatta. 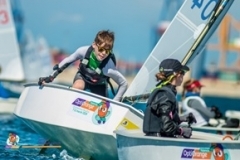 Organised by the Real Club Náutico Valencia and the Russian St.Petersburg Yacht Club, the event brought together 330 sailors from over 15 countries. 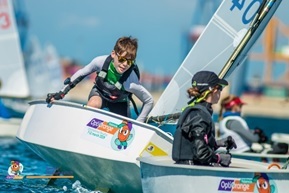 With world level sailors on the crowded start lines, competition was pretty tough for all the NYC Oppies including Lucia Cullen, Christian Ennis, Sam Ledoux, Fiachra McDonnell, Lauren O’Callaghan, Luke Turvey and Clementine van Steenberge. Racing kicked off International Women’s Day, and as the competition rolled on flat seas and little breeze was the order of most days. 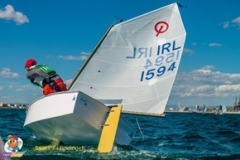 Divided into various flights for the first two days, the Irish sailors still managed several top ten results and earned qualifications across the Gold, Silver and Bronze fleets for the final day of racing. In the end it was Latvian Martin Atilla who took the top title and the rest of the top ten went to host nation sailors. 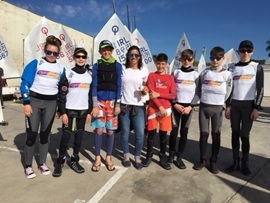 The NYC sailors gained excellent experience as they prepare for trials at the end of April in Crosshaven and, despite the light breeze for sailing, the Valencian sunshine, fresh orange juice and the Fallas festival fireworks did not disappoint!